In May 2018, an interdisciplinary group of researchers from Stanford University’s Hopkins Marine Station, the Monterey Bay Aquarium, MBARI, the Schmidt Ocean Institute (SOI), and other organizations conducted a month-long research cruise to the “White Shark Café.” Half way between California and Hawaii, this remote part of the Pacific Ocean is a gathering area for white sharks, and the researchers were trying to find out why. 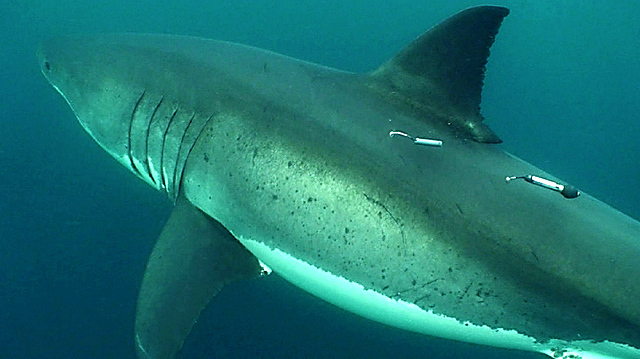 The researchers tracked 20 individual sharks to the Café using pop-up satellite tags. The tags were programmed to pop off the sharks during the cruise. The researchers were able to recover 10 of these tags, containing invaluable data about the sharks’ migration. These tags also gave the researchers new details about deep dives that the sharks make while at the White Shark Café. The researchers then used a variety of oceanographic instruments and sea-going robots, along with SOI’s state-of-the-art research vessel Falkor, to study ocean conditions and marine life at the White Shark Café. MBARI deep-sea biologist Bruce Robison used SOI’s remotely operated vehicle (ROV) SuBastian to study the animals at depths frequented by the sharks. In the video below Robison describes some of the animals he observed during these dives. Other researchers used echo sounders and dragged nets through the depths to find out what kinds of squids, fish, and other hard-bodied animals live in the depths. They also used “environmental DNA” to test for the presence of sharks and their prey. Although this part of the Pacific Ocean has been considered an “oceanic desert,” the researchers found deep layers of phytoplankton (microscopic marine algae) that were not visible in satellite images. These algae, along with the larger animals observed, suggest that the area is more biologically productive than the researchers expected. June 13, 2018 – A monthlong research cruise revealed that the “White Shark Café” supports much more abundant and diverse marine life than scientists expected. Apr 27, 2018 – An interdisciplinary group of researchers are conducting a monthlong research cruise at the “White Shark Café,” in the Pacific Ocean between California and Hawaii. Jun 29, 2016 - Each winter, large white sharks leave the California coast and swim halfway to Hawaii, congregating in an area known as the “White Shark Café.” By attaching a miniature video camera tag to a white shark’s fin, researchers at the Monterey Bay Aquarium and the Monterey Bay Aquarium Research Institute (MBARI) hope to collect video footage that shows—for the first time ever—exactly what the sharks are doing out there.